"At the core of The World at Peace is a blues sensibility. It is an orchestral redemption song that celebrates world music, a passionate tone poem about our human drama, our endless possibilities." 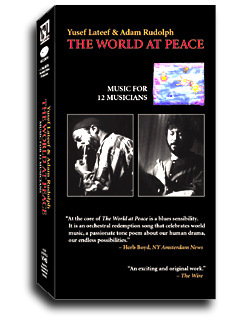 The legendary composer and woodwind master Dr. Yusef Lateef is joined by Percussion innovator and composer Adam Rudolph in rare footage from the concert debut of their compositional collaboration The World at Peace. Hailed as "An epic work that straddles the fields of tone poetry and world music." by the Jazz Times and "One of the years major events" by the LA Weekly, The World at Peace is an interpretive work, delicately balanced between autophysiopsychic and written musics. Its pluralistic essence reflects the ideal state of peace between humans; thus a music which is created without borders, having only the infinite parameters of human life as a transmitter of its force. Dr. Lateef is known as one of the most innovative and influential artists working in the arena of creative and world musics for the past sixty years. Adam Rudolph has been called "a pioneer in world music" by the New York Times and "a master percussionist" by Musician magazine. Since 1988 they have collaborated together as performers and composers on numerous projects including duos and large ensembles. This unique documentary includes the complete concert performances of 14 original compositions as well as interviews with the composers. Recorded live in concert June 16 & 17,1995 at the Jazz Bakery, Los Angeles, CA. Commissioned by the Meet the Composer/Rockefeller Foundation/AT&T Jazz Program, in partnership with the NEA. Special thanks to Robert Browning, Director, World Music Institute. "An exciting and original work"
"An epic work that straddles the fields of tone poetry and world music." "A peaceful feeling and a sense of sparkling, iridescent beauty." "This music is challenging, soothing and rewarding." "Lateef's robust sound and dynamic phrasing brought the sheer essence of jazz history to every note he played. Rudolph's drumming was equally fascinating, spinning with lightning speed and propulsive acceleration." "One of the year's major events"
"This is joyous music, the music of life and love. It heals the body and the soul." Composers/multi-instrumentalists Yusef Lateef and Adam Rudolph haven co-created a master work so far-reaching in its beauty, range, and significance that, in a better world, this album would inspire T shirts worn across the nation. Picture a 12-piece orchestra with percussion from Africa, the Americas, India, and the Middle East; a rainbow of wind instruments (shenai, musette, kudu horn, bass clarinet, tuba, saxophone, trumpet, flute); and ethereal strings (cello, harp, violin, and classical acoustic and electric MIDI guitar). Now, picture a seamless integration of those textures and tones, a ritual celebration of live trance beats, shamanistic polyrhythms, melodies with wings, drum skins on fire, space and silence between thick brush strokes of color. The compositions are as harmonically elegant as any score in the Duke Ellington catalog. At once earthy and cosmic, Lateef & Rudolph's two-CD set transcends the myopia of genre-based thinking. Reaffirming the power of the creative spirit, The World at Peace offers up pure expression as a source of positivity and wonderment. Its cultural import spans the planet.